Freddie Scott has a history as a player in the National Football League, a pastor, executive coach, public speaker, and author. He is the founder and president of Unlock The Champion, a non-profit organization committed to leadership development and empowering people to understand and maximize their influence by "Knowing their worth, and leading with values". 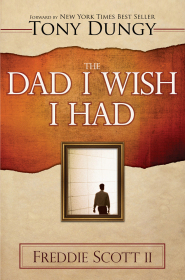 Freddie Scott is tackling this issue with "The Dad I Wish I Had." My hope is that this book inspires you to think about ways we can get our dads back to their rightful place in this country--involved and active in their children's lives. Men are missing across America--missing from their families. Countless women and children are hurting as a result. Pastor Freddie Scott and Unlock the Champion are committed to restoring men to their vital roles as husbands and dads. Freddie is a rare blend of ministry and Athletics. I strongly recommend Freddie as a speaker who can effectively reach people through his life experience of playing in the NFL and ministry. He truly has a passion to change lives.